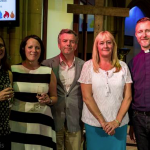 District Manager Quentin Edgington and Sunbury Branch Arranger Mia Taylor were recently invited to attend the Licensing of the New Vicar of St.Saviour’s Church Sunbury. The service, which was held at the end of July, welcomed Reverend Ron Cross to the Church. Photo from left to right shows Rev. Claire Clark (curate ) Mrs Rowena Cross, Quentin Edgington, Mia Taylor, Rev. Ron Cross.